President Trump has proposed de-funding the National Endowment for the Arts (NEA) and other budget items conservatives have been dying to get rid off for decades. Liberals are understandably upset and the debate has centered around the controversial and offensive artworks that the NEA has sponsored in the past, as well as the weird art they still promote sometimes. Jazz Shaw at Hot Air says this is precisely the wrong argument to have. He argues that the NEA should be done away not because they supported weird or offensive art, but because the federal government shouldn’t be supporting art at all. The arts, like everything else in society, can rise and fall on their own merit. The reason that we don’t have tremendous federal funding supporting the creation of blockbuster Hollywood movies is that such offerings tend to be popular and the business of making them is profitable. Creating paintings, sculpture, poetry or theatrical performances may not be as profitable, but if it has value to sufficient people, patrons may be found to support the work. If no such patronage is forthcoming then perhaps the “art” is better left to the lonely artist toiling away in their studio. Unfortunately, Shaw is wrong because this is precisely why we should have public support of the arts, especially those less commercially viable forms. Look, I think NEA funding can be reduced or even eliminated, because I think having a federal bureaucracy as gatekeeper for the arts has been disastrous (cf. Mapplethrope and Serrano as Shaw references them). A gorgeous video of Mont Saint Michel in Normandy, France, shot on an iPhone 7. This small London shop makes some of the nicest globes on the planet, including an $85,000 replica of the Churchill globe, a 700-pound monstrosity that sat in the offices of Winston Churchill and Franklin Roosevelt that were incredibly detailed and on which they planned World War II strategy together. The Bellerby globes are handcrafted and hand-painted and very accurate. They take six months to make. It would go perfectly in my imaginary mahogany-lined library/study/man-cave. It’s tempting to think of era of black-and-white photography as is the whole world was in black and white then. That’s why I continue to be fascinated by colorized photos in which a photo retoucher puts the color into photos as the scene might have originally been. Petapixel shows off 10 of these photos from Jordan J. Lloyd of Dynamichrome, who is producing a book of 130 of the photos. “Renowned for his precise composition, attention to detail, and painterly use of light and color, Gervais-Courtellemont became a photographer for National Geographic. He continued to travel and give lectures on photography. These are some beautiful photos of an era we usually only see in black and white. It’s easy to forget that our grandparents lived in beautiful color too. We attended a baptism of some friends’ daughter at Sacred Heart Church in Newton on Saturday. 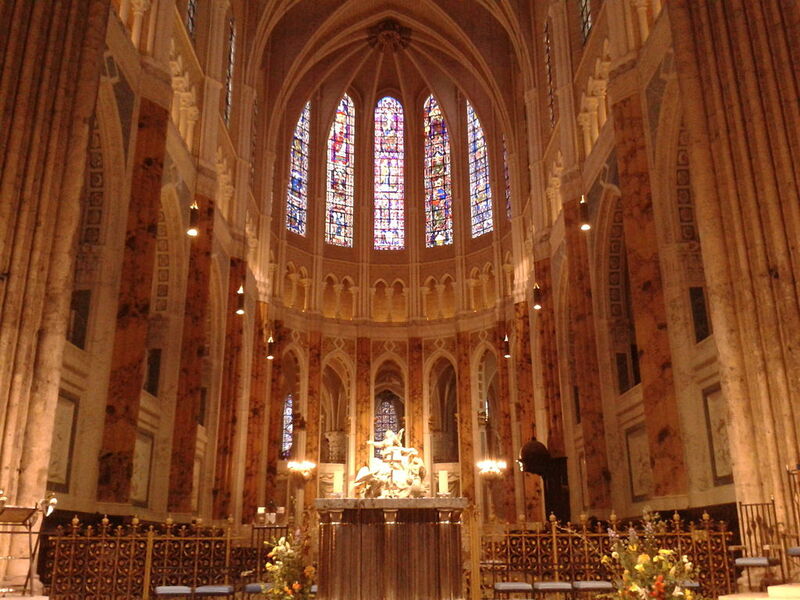 It is a beautiful church built in an Italianate style. I’m no architect expert, but it had the feel of architecture around Assisi. The church has a fascinating history. At the front, to the left of the sanctuary is a portrait and a bronze plaque with text of a letter from Cardinal Eugenio Pacelli, the Vatican Secretary of State, in the 1930s, thanking the parish for its hospitality in hosting him for a brief stay. Beside the plaque is a very large, very old paschal candle from the Vatican, which was obviously a thank-you gift. Cardinal Pacelli would go on to become Pope Paul VI Pius XII. Speaking of bishops, the parish has a history of pastors who became bishops. Cardinal Spellman of New York was its pastor at the time he received his episcopal appointment and then Cardinal Cushing was pastor before becoming archbishop of Boston. He was followed by another pastor who became an auxiliary. How you’d like to be the guy who followed him and didn’t become bishop? I don’t know exactly what it is about Shorpy that draws me in so much. Shorpy is a self-proclaimed historical photo archive, a website that’s been around since at least February 2007, each day posting a public domain, high-resolution historical photograh. One day it could be a photo of a building from the 1930s, the next day a picture of migrant workers in 1900, the day after that, a suburban family at Christmas in the 1960s. The beauty of Shorpy is that you never know what will be next. The curators of the website source their photos from public archives like government libraries, including ancient scanned photographic plates, and even from collections of family photos bought at yard sales and on eBay. I really enjoy the street scenes for the details of historical life they provide. Because the photos are so high resolution, when you click on one, it is enlarged enough to be able to read signs in the windows and even see people going about their daily business. Others that show government offices or industrials space from a century ago or more or less provide a fascinating glimpse into the way people used to work. It’s especially intriguing to see offices without the automation we have today and the number of people doing a job decades ago that can be done by one person with a computer now. There’s a little bit of everything in the archive, like I said. There are photographs of auto accidents in the 1900s, photos of once-famous, now-obscure politicans and entertainers spanning the decades, and pcitures and pictures of dressed up kittens from the 1910s that prove that cat fascination didn’t start with the Internet. There are scenes of famous events, such as San Francisco after the 1906 earthquake, and mundane events like people enjoying the beach in old-timey bathing attire. Another nice part of the site is the community that exists around it. As each photo is posted, fans begin examining them and start posting comments. Often, for street scenes, they’ll do the research to find the exact location today on Google Street View and post it so others can see a comparison. Or they’ll pore over the photos and look for interesting details to point out. Or they’ll do historical research on unfamiliar elements and tell others about their findings. Among my favorite photos on the site are those that come from the Massachusetts area, including street scenes, photos of buildings that don’t exist any more in familiar locales, and famous personages of the past. 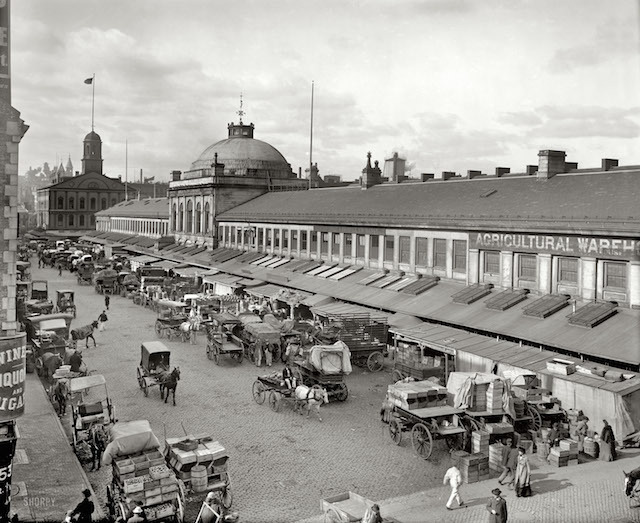 I have downloaded many of them, including photos of Boston’s Financial District from the first half of the 20th century, of the long gone railroad station in downtown Salem, and many more. I use them as screensavers on my iMac at work, a kind of melding of the past and the future. Why do I love Shorpy? It’s hard to say why, but it is a lot of fun. 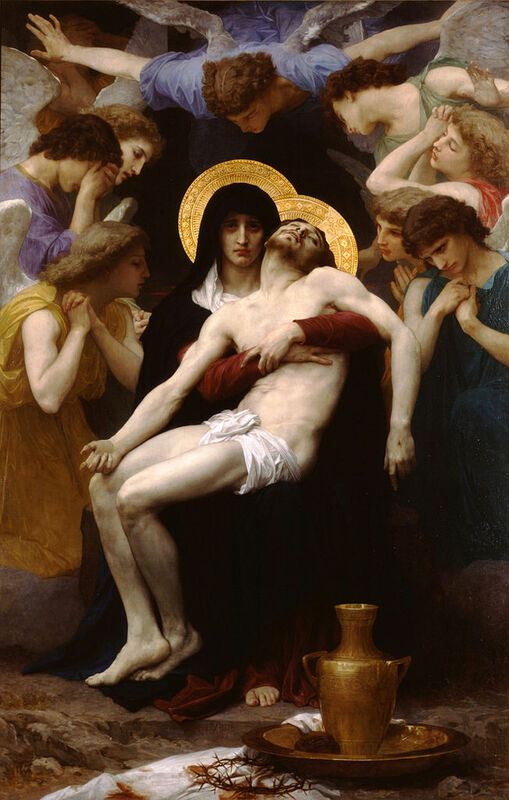 At the start of this Holy Week, I’ve been contemplating two different pieces of religious art by the same artist, William-Adolphe Bouguereau, a 19th-century neo-classicist that some associate mainly with portraiture and paintings of naked ladies, but he’s also painted some fairly well-known religious art. He was a devout Catholic, who especially in his latter years as he suffered personal loss of the death of his wife and 4 of his 5 children, turned to religious subjects often to express his grief and faith. That’s what makes the two pieces I’m contemplating especially relevant this Holy Week as they show the same subjects separated by about 30 years: Jesus and His Mother. 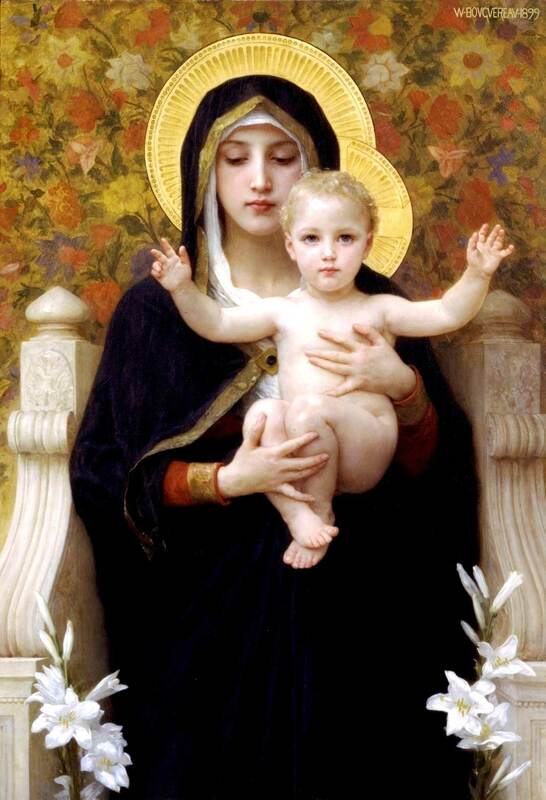 The first is The Virgin of the Lilies (or the Madonna of the Lilies) (1899), which depicts Mary and the Christ Child and is similar to another work by Bouguereau, The Virgin with Angels(1900). Both show the Blessed Mother, clothed in black robe, holding the Child, her eyes cast downward, as if she is presenting him to the world and willing herself to fade to the background as her Son becomes the focus of attention. She is demur, quiet, understated, calm. Contrast this with the powerful and emotional Pieta (1876). In this painting, Mary is again clad in black and again holds her Son, but now he lies limply against her, dead and recently removed from the cross. 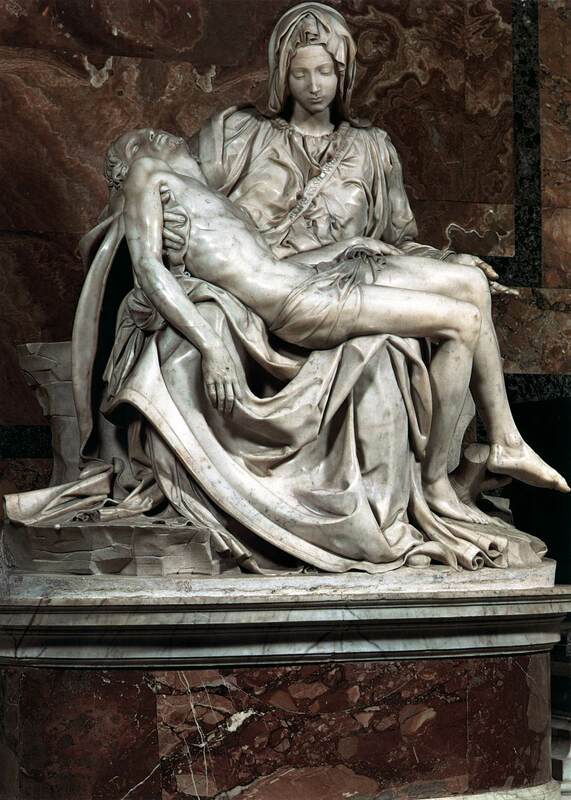 She grasps him in a close embrace, in contrast with the open embrace we find, for example, in Michelangelo’s Pieta. This is not a Mary offering her Son’s sacrifice to the world. Look into her red-rimmed and weeping eyes and see the world-wrenching sorrow of a perfectly pure heart pierced by the sword of our sin, a sword that struck down not us, the deserving, but Christ, the Innocent One. Her eyes accuse, not with anger, but with the sorrow of a mother who grieves one Child who died in the place of her other children. Surrounding them is an arc of weeping angels, a rainbow of them, evoking the rainbow covenant with Noah, which Christ fulfills, reminding us that rather than wipe us out to wipe out sin, God instead sends His Son to pay the price. Two images of a mother and a Son portray for us the complete arc of the story of Christ, who was born into this world, taking on our flesh, sanctifying it with His innocence, made possible through the fiat of a woman, and who died for us, conquering sin and death in the process, but at the cost of the spilled Blood of the Second Person of the Trinity and the broken heart of His Mother. As I pray this Holy Week and think about my own role in the Passion, my own sins piled atop the towering pile of humanity’s debts paid by the Savior, the eyes of my Blessed Mother haunt me, accusing me in her gentle way, of every iota of pain they added to the suffering of Christ upon the Cross. After we’ve sold off the Michelangelo’s and the Bernini’s and the patrimony of 2,000 years of art given for the glory of God and then distributed all the money, then what? It’s all gone. The great treasures of Christian art will be hanging in the private mansions of billionaires or in sterile museum galleries instead of in churches where they inspire men to lift their hearts and minds to God. And the poor will still be poor because even if we sold it for a few billion dollars it won’t even make a dent in material poverty. Frankly, the Church already spends billions on charity worldwide through the combined activity of all the faithful and will continue to do so. Must we sell the artwork too? Frankly, it’s crass even to consider it. For some reason, “priceless” has ceased to mean “you can’t put a price on it” and now means “really, really expensive.” No, the art and architecture created by the men and women putting forth all their talent and skill as an act of praise for God really is priceless. You cannot put a price on it because it’s not simply an object of utilitarian economic value. What a drab world it would be if everything had a price tag: the Mona Lisa; Chartre’s windows; the Sistine Chapel’s frescoes; love; friendship; wives and children. What sad utilitarianism we would subject ourselves to if there were no beauty for beauty’s sake, no art for God’s sake, but only products for economic transactions’ sake. The poor know well the value of art and beauty for the glory of God. Chartre’s windows were not merely decorative but are a catechism for people who were mainly illiterate, telling the stories of salvation in colored glass for a people looking for hope. When you enter the cathedral, your eyes are drawn up to the soaring heights as a rainbow of light streams around and you feel as though you have entered the throne room of Heaven. If that’s how it can affect someone raised on a steady diet of the wonders of Hollywood special effects, imagine what it could do for someone who’d never seen a building larger than his local lord’s keep. His imagination would soar. Has anyone ever asked the proverbial poor if we should sell off the treasures of the Vatican for their benefit? Perhaps they’d be horrified at the prospect. After all, held by the Church, the treasures belong to all mankind and they are given proper and due reverence. Sold off, they’d belong to a man to dispose of as he wills. Priceless artwork is priceless precisely because it cannot and should not be sold. Ever. It’s value goes beyond dollars, which themselves are not the ultimate cure for all that ails humanity. That’s a lesson those of us who live in the consumerism-addled West would do well to learn. The Church should sell all her priceless art… Then what? Nevermind that these were painted for the Glory of God to inspire and elevate those who would worship in the chapel. Nevermind that the Church holds them in custody for the good of all humanity. No, what we should do is find someone–probably some billionaire private collector–to buy Michelangelo’s most famous work for millions, maybe hundreds of millions of dollars. So he could put it in his private collection. Or maybe loan it to a museum. Because being in a museum is better than being in a chapel? But of course then we’d say it was wrong for this billionaire to hold these priceless artworks so he should sell them and give the money to the poor. And then the next owner should do the same. And so on. 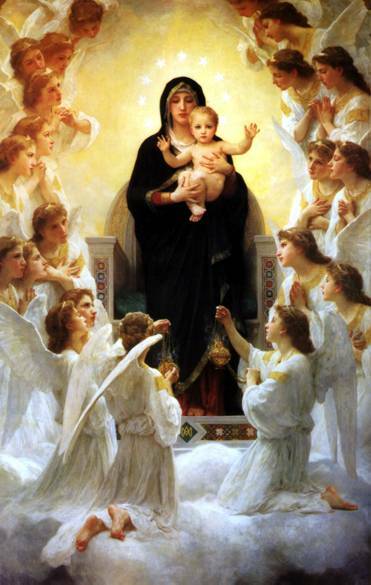 In fact, who exactly is supposed to own these priceless artworks for the good of humanity and the Glory of God. The kind of person who says we should sell the artwork in churches to support the poor don’t understand churches. Or the poor, having never visited the churches of poor people where the one spot of beauty and art in their lives is that artwork in their church. Certainly some of the most beautiful churches around Boston, themselves works of art, were built precisely by the poor, donating hours of free labor outside of their own grueling jobs, not to mention whatever meager pennies they had. The Church is already the world’s leading charitable nongovernmental organization, doing more for the sick, the hungry, the poor and needy than any other. Really is such drivel really motivated by anything other than contempt for the Church and based on anything other than age-old anti-Catholic canards? 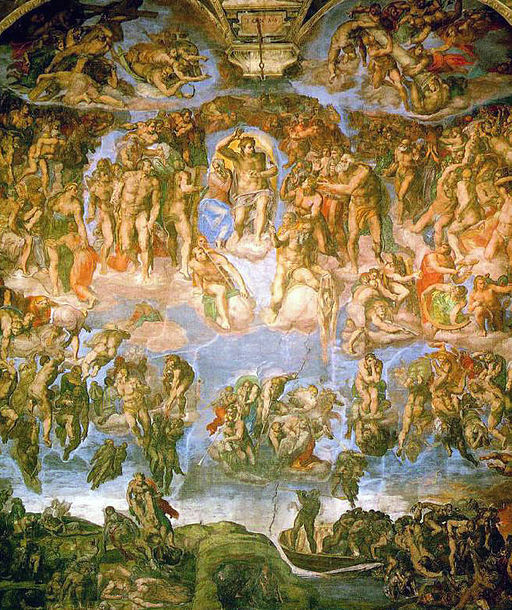 My hope is that as the cardinals contemplate the election of our new Pope as they sit in the Sistine Chapel in the coming days, that the beautiful art of Michelangelo inspires them to greater discernment. I certainly don’t think that would happen if they were sitting in a bland, whitewashed box hung with felt banners.